Opening Night Invitations — Designated company representatives will receive complimentary invitations (based on membership level) for ART's Opening Night Gala performances. Complimentary Tickets — Companies are entitled to a number of complimentary priority tickets per season (based on membership level) for any ART production. Special Discount Ticket Offers — Company employees are entitled to discounts (based on membership level) on single ticket purchases. Corporate Club Salute Evening — Company representatives are invited to a special evening at ART saluting Corporate Club members. Public Recognition — Visibility is gained during the 2002 season (based on membership level) through a company listing in the program for each production, advertisement space in program and business mention as co-sponsor in all advertisements. Newsletter — A complimentary copy of ART's monthly newsletter will be mailed or e-mailed to designated company representatives. 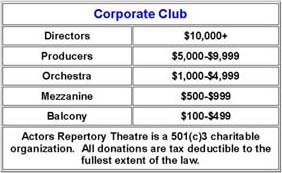 At the Directors Level, corporations may sponsor or partially sponsor one of ART's productions or programs. ART will custom design a sponsorship package to fit the needs of any corporation. In addition to widespread recognition through ART's marketing and publicity materials, Directors will receive prominent placement of corporate logo or name in lobby of performance venue • Business mention as co-sponsor in all advertisements • Complimentary and discounted tickets. Sixteen complimentary tickets per season • Complimentary invitations to all Opening Night Gala performances • Prominent placement of corporate logo or name in lobby of performance venue • Business mention as co-sponsor in all advertisements • 20% employee discount on single ticket purchases • and Basic Corporate Club Privileges. Twelve complimentary tickets per season • Complimentary invitations to Opening Night Gala performances • 15% employee discount on single ticket purchases • and Basic Corporate Club Privileges. Eight complimentary tickets per season • Complimentary invitations to two Opening Night performances • 10% employee discount on single ticket purchases • 5% employee discount on subscription purchases • and Basic Corporate Club Privileges. or you can email or call us at 917+463-1097, for further information.